PagerDuty serves as the hub of your operations, aggregating all of your infrastructure monitoring tools and alerting the right people & teams at the right time. Sign up today for a free 14-day trial at pagerduty.com/twist. It’s the Futures of the Smartwatch, Transportation, and On-Demand from LAUNCH Mobile, Wearables & IoT! 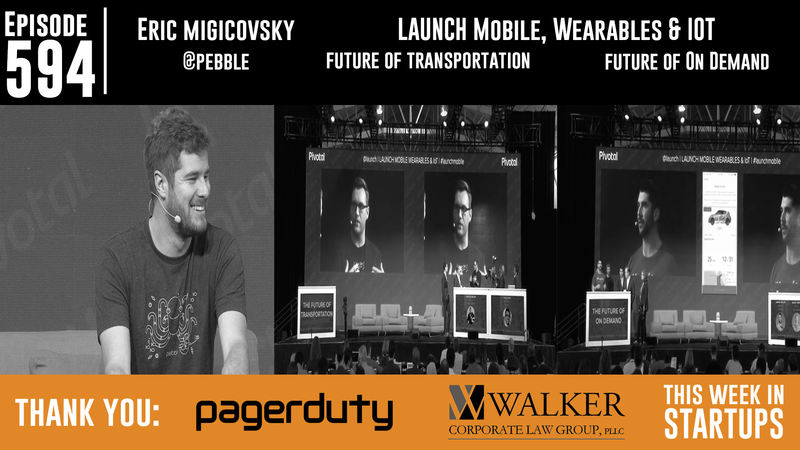 First, Eric Migicovsky, founder and CEO of Pebble, shows us his latest in timeround and talks with Jason and Peter Rojas (co-founder of Engadget and Gizmodo) about how apps are becoming more integrated into smartwatches and where the technology is headed. Second, Jason, Peter, and Janice Fraser (Director, Innovation Practice at Pivotal) explore the Future of Transportation with Skully, a motorcycle helmet with a heads-up display that provides information like speed, upcoming traffic, weather, and maps to keep the driver’s eyes on the road, and Automatic, a device that connects to the car, allowing users to access all of the car’s data and become better drivers. Third, they look at the Future of On Demand and apps as a service with with Luxe (valet parking), Scout (personal travel concierge), and Wrapify (make money while you drive). LAUNCH Mobile, Wearables & Iot was presented by our friends at Pivotal.